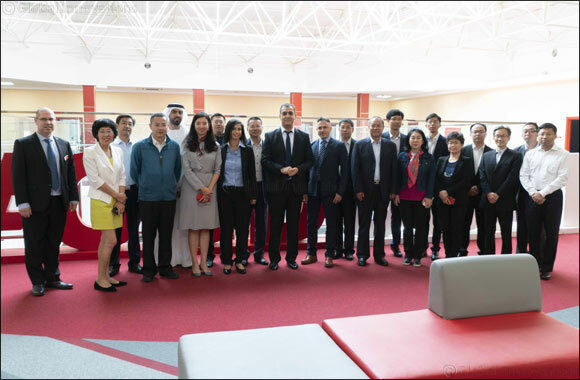 Dubai, December 27, 2018: A delegation of 16 senior Chinese business executives attended a workshop entitled “UAE Investment Landscape” to explore investment potential in the UAE recently. The group included CEOs, CFOs, Vice Presidents and Senior Managers from the China State Construction Engineering Corporation (CSCEC), China’s largest international contractor listed among the world’s top 225 international contractors. The state-owned mega-enterprise administered by the Central Government of China operates actively in domestic and international markets with construction and real estate as its core business. The workshop was facilitated by Canadian University Dubai (CUD) in collaboration with Oriental Wise Educational Consulting FZ-LLC and delivered by the Faculty of Management consisted of Dr. Marc Poulin, Dean of the Faculty of Management, Dr. Hanan Mustapha, Assistant Professor and Mr. Haikem Salim, one of the university’s alumni. Prior to the workshop the visiting business executives met with Dr. Karim Chelli, President and Vice Chancellor of Canadian University Dubai. The event was the result of an ongoing collaboration between CUD and Oriental Wise Educational Consulting, which focuses on high-standard educational consulting services that include setting up branches for Chinese universities and educational institutions through the Sino-Arab cultural exchange. The event came on the heels of a recent recruitment trip by CUD to China, which underlines the importance of CUD’s engagement with a country that accommodates a quarter of the world’s population. At the conclusion of the workshop the delegates were escorted on a visit to Dubai International Financial Centre (DIFC).